Ispahbads of Tabaristan. 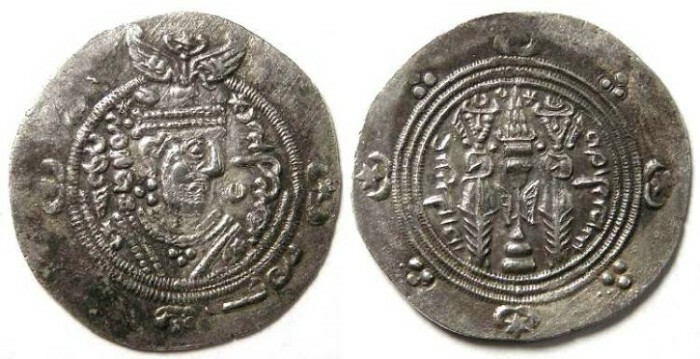 Khurshid II, AD 740 to 761. AR 1/2 drachm. Khurshid II, AD 740-761. Until their year PYE 110 (AD 761) the Ispahbad rulers of Tabaristan were an Independant Kingdom. Denomination : Silver 1/2 dirhem. Date : Year-104 (AD 755). Size : 24.3 x 25.1 mm. Weight : 2.04 grams. Obverse : Head of Khurshid right, with his name in Arabic. Reverse : Sassanian style fire altar with attendants, with the mint and date at the sides.